A couple of weeks ago we had a post about the amazing wood work done by Melissa Jones where she was creating pieces of arcade character art in wood. 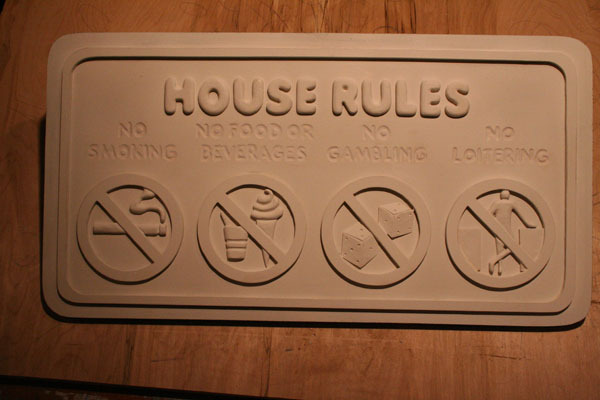 Her latest project is taking the infamous “house rules” one may see at a typical arcade and carving that into wood. It still needs to be painted but you can otherwise see what it will entail. It will also be available as a resin cast so anyone who wants one can get their hands on it and they even offer custom paint jobs for it. It’s definently tempting to get one of these for my arcade, this would be much cooler than the standard flat sign.